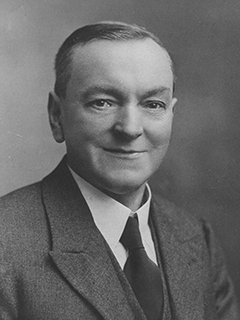 At first committee meeting on Oct 11th 1911, the Honorary Secretary, Frank Lathom, was elected to be the club’s representative on the NAU. However within a few months, following secret negotiations, the AAA and the NCU settled their differences and with this agreement the support for the NAU evaporated. Wirral AC also bowed to the inevitable, with the second AGM on Sept 18th 1912 agreeing that the rules were passed with AAA substituted for NAU. Overtures from West Cheshire Harriers suggesting amalgamation were declined and after what must have been a roller-coaster ride for the officers in the first year, the club was on its way. In fact the club had been on its way for some time. 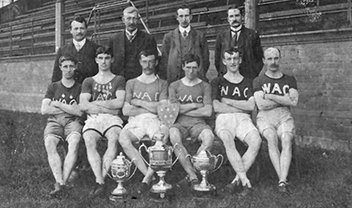 It had already won the Liverpool & District Cross Country team race in 1912, placing 6 counters in the first 8 including the winner, Sep Francom. The other counters were A Bethel (2nd), H Davies (5th), G Jenkinson (6th), Lance Finlay (7th) and Eddie Curran (8th). The team with some officers who presumably include the first President, Mr E Battersby, and the Hon Secretary and Treasurer, Frank Lathom, are pictured below. Sep Francom is seated, third from the left. The sharp-eyed will recognise the Oval stand in the background. Incidentally, the team are wearing the first official club vests, blue vests bearing the letters W A C. The present green and white hoops were not adopted until the late 1920s. The cup on the left was the Liverpool&District Team Challenge Trophy, which the club subsequently won outright and is now used as the trophy for the Wirral AC Senior Ladies Cross Country Championship. Sadly sometime down the years, it has lost its lid – before, I should hasten to add, its time as the Ladies Trophy. A founder member, Sep Francom was the leading runner in the club’s early years. A life-long Wirral resident, he was already an established athlete on the local scene when the club started, having been Senior Captain of Sefton Harriers in 1905. After his win in 1912 mentioned above, he went on to win the L&D Cross Country title again in 1913 and 1914, when the First World War cut short his run of success. When the championships restarted, he led the Wirral team to a further win in 1921 and took the individual title himself in 1922, beating his 20 year-old son, Arthur, into second place, a family double which is unlikely to be repeated. 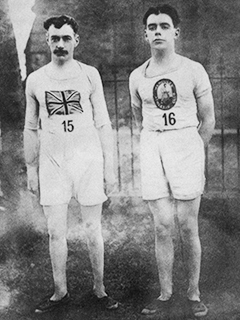 Sep had considerable success on the national marathon scene, winning the Hull “20 Mile Marathon” three years in succession between 1912 and 1914. The trophy which he won outright after his third victory can be seen in the centre on the picture of the 1912 team. He was selected to run for Great Britain in the Olympic Marathon in Stockholm in 1912, where sadly he figured on the list of non-finishers on a hot day. In the photograph on the right, Sep, wearing his GB vest from that occasion, is seen with his son following their Liverpool&District double act. Arthur’s vest proclaims his membership of Hercules AC, evidence of an interesting episode in the club’s history. As athletic activity re-started after the First World War, there is much mention in the club Minute Book of amalgamations, but not until September 1921 does a definite proposal emerge. The Hercules Athletic Club was an amalgamation of Wirral AC , West Cheshire Harriers, Wallasey AC, Liverpool Boundary, Knotty Ash AC and possibly others. How this new club was supposed to work is unclear as the Wirral minute book continues to report meetings and the election of officers of the Wirral branch of Hercules AC. What is clear is that after some initial enthusiasm, Hercules failed in its prime aim to produce stronger teams. Regular complaints begin to appear in the minutes about how Hercules was being run and its failure to select and field representative teams, though what role, if any, Wirral members were playing in the organisation is not mentioned. By 1923, the Wirral branch had had enough and the Annual General Meeting on Sept 23rd voted to withdraw. After this, Hercules seems to have folded, taking with it into history the club’s progenitors, West Cheshire Harriers. Following the Hercules affair, Wirral A C invited Charles Ledsome, himself a successful athlete with West Cheshire Harriers in the 1890s, to become Club President. He accepted and held the post for over 20 years, in which time the club established its own headquarters at Rose Cottage in Holm Lane and produced a National Cross Country Champion in Sam Dodd. A butcher by trade, Charlie traditionally provided a goose as a prize for the Christmas Handicap. A group of club members scattered his ashes over the club cross country course now covered by the Holmlands Estate – do not doubt it, there is a photograph of the occasion in my collection. Truly he deserved the epithet “Mr Wirral” as the late Charles Rice once referred to him. Sam Dodd joined Wirral AC in 1928 and as his previous experiences included races outside AAA laws for which cash prizes had been awarded he had to appear before the No5 District Committee (a pre-decessor of the Merseyside CAA) to apply for reinstatement as an amateur. Because of his youth, this body was able to display its wisdom without too much agonising and cleared him to compete. His cross country career includes 8 Wirral AC Senior titles, 7 Liverpool&District titles, 5 West Lancs titles and a Northern title, but the jewel in his crown is the National title won in 1934. Since he had come second the previous year and just won the Northern, it was not too much of a surprise, but the manner of his win was exciting by any standards. On the second of the three laps of Himley Park in the Midlands, Jack Holden (Tipton), Alec Burns (Elswick) and Sam had emerged as the principal contenders. Burns made a determined effort to break the others and by the start of the third lap had established an apparently unassailable lead of 200 yards. However as Burns tired, Sam steadily closed the gap and swept past in the final few hundred yards to win by 8 seconds. In the picture he is seen with the ECCU (now ECCA) Championship trophy. 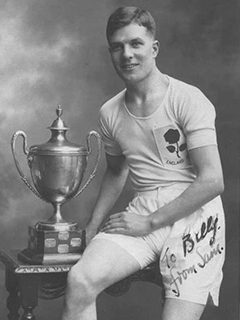 “Billy “ almost certainly refers to Bill Weston, the club Secretary from 1941 to 1959. 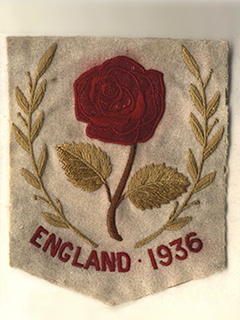 Sam ran for England in the International (now the World) Championships in 1933,34 and 36 but it was not until the last occasion that he achieved his ambition to be a scorer in an England team. After finishing 4th in the 1936 National he went on to take 11th place in the International and count for a winning English team. Pictured on the right is his track suit badge from that event which was presented to the club in 1983 and still adorns the wall in the Wirral AC club rooms. Not for Sam the joys of foreign travel however. His three Internationals were at Newport, Ayr and Blackpool!